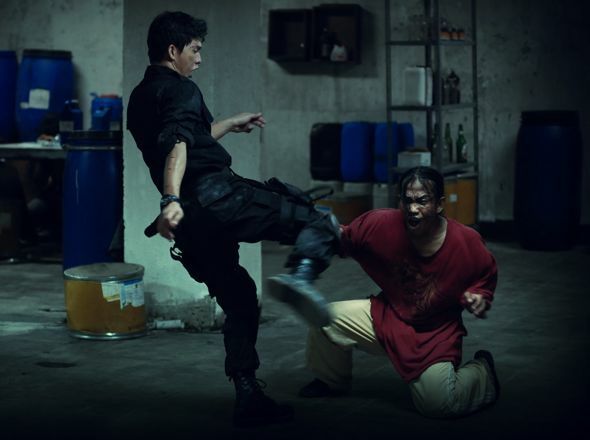 The Raid – Netflix Highlight – Screenkicker! Oh hi, I’m glad you came. You’re just in time for a very special event. Yes that’s right, it’s the birth of a new regular Screenkicker feature. Ladies and gentlemen, welcome to the first Netflix highlight! The first film to get this treatment is The Raid which is currently available to view on UK Netflix, as yet there is no word of it appearing on the US and Canada versions. Anyway that’s the boring stuff out of the way. Now we can get down to the review. In short The Raid is the movie equivalent of getting kicked in the face 50 times while falling out of an out of control rollercoaster. Twice. It’s wall to wall action with absolutely no let up. The story couldn’t be more simple. Take one tower block, fill it with a load of heavily armed criminals. Next add a highly trained police squad who have to fight their way to the top. Voila! You have one of the best action movies of the past ten years. Directed by up and coming Welsh director Gareth Evans, The Raid is set in Jakarta making it my first Indonesian movie. And what a movie. What sets it apart is that it never ever let’s up. There’s no superfluous side stories, no redundant dialogue, just men fighting with fists and guns and sticks and at one sublime point, a florescent strip light. When the team of cops first enter the block, Evans does a fantastic job of ratcheting up the tension before the movie explodes into some of the most spectacular and inventive violence you’ll see for a long time. The hero of the story is Rama (Iko Uwais) a moral, family man police officer who just happens to be an absolute badass. He uses Pencat Silat, a hyper kinetic Indonesian martial art that is a million miles away from the balletic wire-fu of a lot of recent Chinese action films. 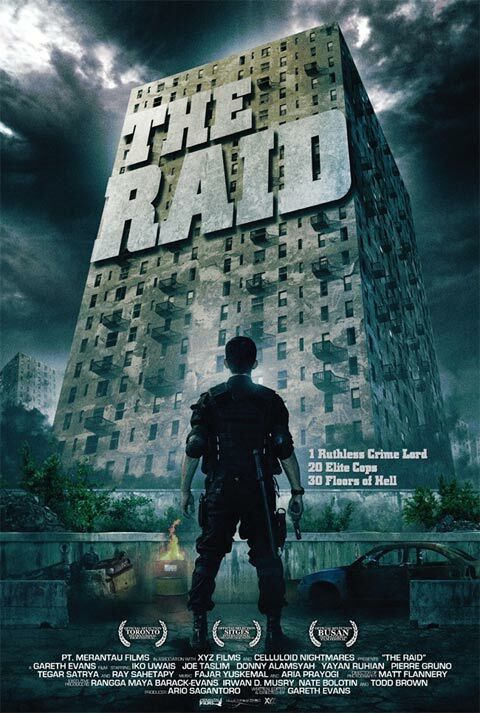 The Raid also feature some memorable and imaginative deaths including a piece of stairwell contortion and a particularly nasty incident with a broken door. So I think you can probably tell I liked the film a bit. Its not completely perfect though, later in the film Evans attempts to inject more plot into it which it doesn’t need and which briefly slows down the action. In fairness though that just me looking for faults. You can tell a movie is good when the harshest criticism I can muster up is that I didn’t want the fight scenes to end. Do yourself a favour and watch The Raid on Netflix or blu-ray. I guarantee that once it’s over you won’t be able to resist the urge to run around throwing punches and kicks at imaginary bad guys. 5 stars from me! Previous I know that guy! 80s action movie bad-guy edition! Great review. My friend and I recently watched this on Netflix and loved it. Great site bud, I am now following, I recently started my own film blog and would love for you to check it out. Yeah I’ve seen it about 3 times now. I think I know some Indonesian now! I’ll definitely check out your blog. Thanks for the follow!